Cut the flesh of the squash into small cubes, about an inch is fine, and place into a heavy pan with a tight fitting lid along with the butter and a crushed garlic clove. Heat gently, giving a stir a few times to avoid the squash burning on the base of the pan and to coat it thoroughly with the butter. When the squash is soft you can mash it and add seasoning to taste. If the mash is too liquid, strain off with a seive and then reduce the liquor by boiling by half. Add this back to the mash and mix. 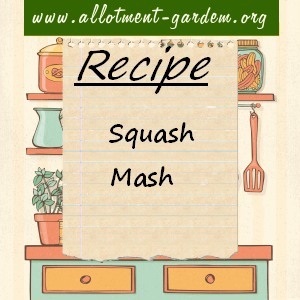 Squash mash is a great accompaniment to any meal and will also freeze well if you want to make a batch. Although squash will usually store well, this is a good way to keep damaged squash with split skins etc. Don’t omit the garlic clove – my brother-in-law, the chef suggested it and it really lifts the taste but you don’t actually taste the garlic.